Happy Kitchen Sink Stamps Monday, thanks so much for stopping by! Today, my card showcases the Kitchen Sink Stamps Multi Step Berries. If you missed the Video I created using these images, you'll find it in this post. My card uses some simple masking using Eclipse Tape, but before I share my card, how about some strawberries themed just for the 4th of July! Now I can't take credit for this cute idea, I saw a picture on Marjie's Dove Chocolate Website, and thought they'd be great to bring along as a dish to pass for the holiday. 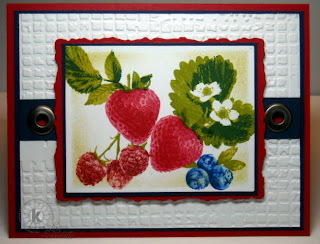 To create my card, I stamped the strawberries from Kitchen Sink Stamps, then masked the images with Eclipse Tape and added the stems and leaves. Leaving the tape in place, I added the Mulberries, Blueberries, stems and leaves. The image is cut with Spellbinders Rectangle Die, then to fill in the White space I used the Wisped Frames Technique, using Kiwi Ink, layered on a Navy panel, then Red Deckle Panel. The White background is embossed with a Texture Fades folder. Be sure to stop by later this week for another creation using Kitchen Sink Stamps! Oh yummy, Lisa. Love this card and also the colour recipe using inks I actually have. Thanks so much. Beautiful, amazing card, I can almost touch those berries from here! RWB Berries are a bang! Ooh! All the berries look sooo yummy together, Lisa! Love it! Those strawberries on your card look so realistic! Not only can you almost touch them, but taste them! Beautiful Lisa! 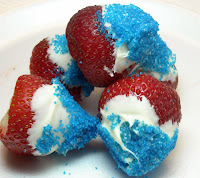 I may even try the RWB strawberries for a 4th party I'm going to, along with my shrimp pasta salad! Beautiful card and yummy strawberries. Your card is so stunning I love it! Lovely! The fruit is so life like. Lisa your so stinkin creative!!! The strawberries look so yummy and I love the card you created for the hostess. What an awesome design with these gorgeous berries, Lisa!! They look stunning on your white on white creation!! Love the fabuous texture and fun jumbo eyelets!! What a fabulously luscious card! Those berries look so real and delicious!!! Lovely card! I am super hungry after seeing those strawberries!!! The card will be perfect to go with the side dish! Yummy! Love the delicious looking berries on your card and love the strawberries dipped in white chocolate.